A news release today from the Food and Agriculture Organization of the United Nations (FAO) stated that, “The FAO Food Price Index fell one percent in October 2012, and for the first ten months of the year food prices were on average eight percent lower than in the same period in 2011. “The Index dipped two points to 213 points from September’s revised level of 215 points. 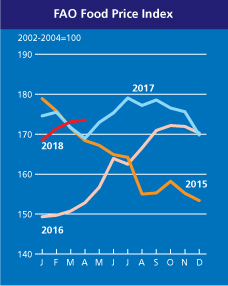 The decline was largely due to lower international prices of cereals and oils and fats, which more than offset increases in dairy and sugar prices. Reuters writer Charles Abbott reported yesterday that, “Federally subsidized crop insurance will be a big target for lawmakers looking to cut the budget deficit in the lame-duck session of Congress opening next week, agricultural policy experts agreed the morning after a status-quo general election. However, the article noted that, “The major U.S. farm groups made a strong crop insurance program their top priority for the bill, even if it meant cutting other agricultural supports. And, Marcia Zarley Taylor reported yesterday at DTN (link requires subscription) that, “In the 1980s, any drought that sent yields in significant parts of the central Corn Belt to 4 to 20 bushels per acre would have triggered another wave of credit delinquencies. But it isn’t just crop farmers who averted what could have been financial cataclysm in 2012. Their creditors got a free pass from revenue-based crop insurance, too.